Gift giving has always been a confusing and tricky affair, don’t you agree? 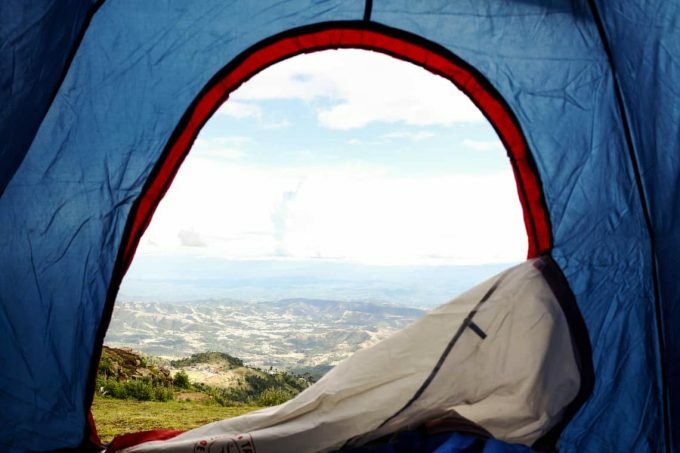 Even if you plan to give your outdoor lover friends some camping gear that you believe they will find useful, you may not know where to start with so many makes and models available today. We compiled a list with some camping gear gift ideas and included a guide on how to pick the right one for the receiver! With that said, which sort of gifts do you give to a special outdoor enthusiast in your life? Well, it looks like you could use some camping gear gift ideas. In fact, they don’t even have to be campers. The products on our list are generally designed specifically for outdoor use, but will also appeal to people who have basic everyday use in mind. For example, there’s a headlamp that will provide a bright light on a remote hiking trail but is also the perfect gift for the person who needs a hands-free headlamp for close-up work on the job. The gift ideas we provide on this list apply to a wide range of outdoor enthusiasts. In this article, we will first focus on the qualities that outdoor enthusiasts generally look for in the gear they use. This will help you choose a present that just any camper, hiker and backpacker will love. After that, we will move on to the top 9 gift ideas for campers that will definitely make your holiday shopping spree fun and easy. Let’s take a look! Durability is very important because campers and hikers are faced with all kinds of harsh conditions in the outdoors. A backpack that rips when it gets the slightest bit overloaded or a tent that cannot withstand a beating from the elements would not be a camper’s preferred gear at all—since they would be entrusting their lives to these gears. When considering durability, you should take into account the material that the gear is made from and how well-designed it is. Typically, tents, backpacks, mats, and other backpacking gears are made of ripstop nylon because it is both really tough and really breathable, but if the product is not well-made, such as if the seams are not properly sealed, the product’s durability will decrease by a huge margin. Car campers may be less concerned about portability, but if your friend or family prefers the good old combination of hiking and camping, portability is really important. The campers’ stamina is greatly tested by nature during such hikes, so the lighter they can make the backpack, the better. Portability also refers to the packability of the gears. Campers often have to get up and go before the sun rises, so gears that take hours to pack or unpack wouldn’t be ideal. Whether a particular gear is waterproof or not is extremely important to a camper—especially if they prefer long-distance hiking. They may need to cross rivers and such, and they wouldn’t be able to do that safely if they have to keep worrying about the state of the gear in their backpack. Even if your friend doesn’t normally do long-distance hiking, they’ll still need their gear to be waterproof because it rains often on the mountainside. The tents, especially, need to have a sufficient capacity to repel water in order to keep the camper warm and dry. You can never predict what’s going to happen in the wilderness, so versatility is very important to campers. Not only do the products must offer a highly practical use, they must also be easy to use and compatible with the other gears. One factor that often decides the versatility of a camping gear is whether it runs on solar energy or not. Electrical sockets are usually not available on the outdoors, after all. Of course, battery-powered gears are good too, but batteries are heavy and if you have to keep a lot of spare in your backpack, it’ll seriously drag you down. That’s why it’s best if you can charge the gear using sunlight. Unless you have unlimited funds, then this one should be a non-factor. However, most of us are not exactly millionaires so price is always a good factor to consider when choosing a camping gift. It’s easy to think that the more expensive the item is, the better. That might be true in some cases but it’s not a foolproof concept. There are great products that can be bought with a decent budget and there are ones that command a high price. So the best advice that we can give is that you should consider your own personal budget and start from there. Have a look at the nine items on the list and let us know if you can recommend other camping gear gift ideas and products for use camping, around the house or on the job. 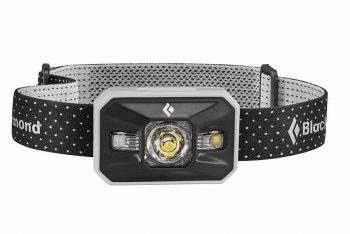 Description: The Black Diamond Storm Headlamp is a high-intensity headlamp that will give you 30-to-40 hours of 250-lumen light on 4 AAA batteries. The Storm uses 2 white LED bulbs, 1 green, and 1 red. The white light is for overall use; the green light is good for hunting (it doesn’t disturb game), and red light is good for map reading (it doesn’t interfere with night vision). All three colors have dimming and strobe capability. The green and red lights can be turned on and off without having to cycle through the white mode. A welcome feature called “Power Tap” enables you to adjust brightness by tapping your finger on the right side of the light. An improved feature on the 2018 model of the Storm ensures that the headlamp produces a consistent brightness over the life of the batteries rather than a very bright light at the beginning of new batteries, then dimming as the batteries drain. The Storm is dustproof and waterproof to a depth of 1 meter for 30 minutes. You can lock the headlamp to prevent it from accidentally turning on in your pack or pocket. A power meter gives you a 3-second reading of how much battery life is remaining when you turn on the light. You may have some trouble with the on-off switch because it’s not very responsive and you have to press it in a very precise way, but this is an otherwise amazing headlamp. Related: Light is one of the two things you should never be in short supply of while you are trekking the wilderness. The other thing is clean water. With this Sawyer Mini Water Filtration System, fresh water should never be a problem for you. Description: The MSR Hubba Hubba NX Tent is a 2-person, 3-season backpacking tent. It is light and free-standing and can be pitched on a sandy beach, a wooden platform or a rocky cliff. This is the 7th incarnation of this Mountain Safety Research classic and the lightest to date. It can even be used as a 1-person tent due to its light weight. There are “fast and light” pitching options that allow you to reduce the weight even further. This easy-to-assemble design results in near vertical end walls and side walls that maximize headroom and overall spaciousness. The tent has two doors and two vestibules so you can enter and exit the tent on your own side. You don’t have to crawl over your tent companion if you have to get up in the middle of the night. The two vestibules have side zippers that allow you to tuck the door out of the way. The doors have “rain gutters” that channel water away from the zipper and help keep the vestibule dry. Inside, the tent is light and airy. Ventilation is good. “Kickstand” vents that prop themselves open help eliminate moisture and keep the tent cool in warm weather. You can increase ventilation by rolling up the vestibule part way, even when it’s raining. The tent has two mesh pockets and hangs loops at either end that provide adequate off-the-floor storage space. One caveat is that this tent has a relatively small floor space. This may present some problems for people over six feet, particularly if there are two of them in the tent, but the combination of two-door design, near vertical walls, good ventilation, and the bright color, make the 2-person Hubba Hubba NX Tent one of the most livable tents in its weight class. 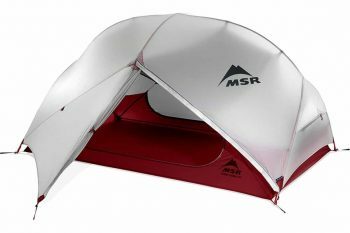 Related: The MSR Hubba Hubba NX 2-Person Tent is a fairly expensive tent so if you want your investment to last, you will need a good footprint. In this case the MSR Hubba Hubba NX 2 Person Tent Footprint as it’s custom-fit for the above featured tent and provides increased protection against wear and tear. 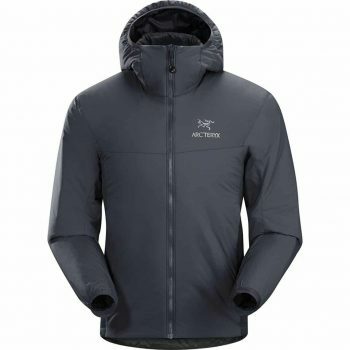 Description: The Arc’teryx Atom LT Insulated Jacket is a hybrid jacket that can work as an insulating mid-layer or as a breathable outer layer thanks to the ventilation provided by the signature fleece underarm and side panels. In addition to providing breathability, these panels reduce bulk under the arms and contribute to the wearer’s mobility, making this a good choice for active sports like cold weather bouldering or backcountry skiing. The outer shell is made with Tinthan, a 100% nylon fabric that’s lightweight and tough. It’s treated with a durable water repellent so a light rain will bead up on the surface or light snow can be brushed off. Arc’teryx uses its own Coreloft insulation in this jacket. It’s lightweight and highly compressible. It dries quickly. It traps air and retains warmth even when wet. If you use the Arc’teryx Atom LT as an outer layer, you’ll need a lightweight waterproof breathable shell to layer over it when a cold wind blows. This jacket is good for temperatures 30° F and up, but any lower and you will start to feel the cold. 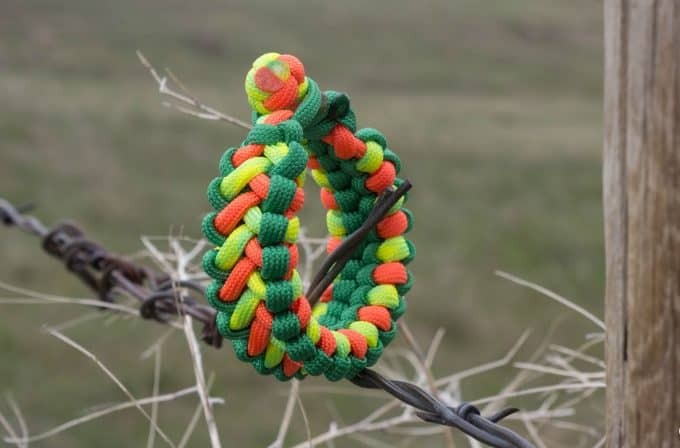 The cuff design is impressive. The cuffs seal in warmth and let you slide the cuffs of your gloves over the top. Another impressive feature is the insulated ScubaHood that fits over a helmet and is adjustable with a drawstring in the back. The elastic hem cinch can be tightened and secured at either hip with a cord lock. All in all, the combination of insulation and breathability, plus low bulk and features like low profile cuffs and the adjustable hood make this jacket a good choice for cold weather backpacking climbing and skiing. It does a good job of regulating temperature and moisture during high energy activities. Related: If the temperature is 30° F or more, you can simply put on this Amazon Essentials Men’s Cotton Pique Polo Shirt under the Atom LT Jacket and you’ll be good to go. Make sure to put on an outer layer if it’s any colder than that, though. Description: When it comes to camping gear gifts, it’s hard to go wrong with a reliable fixed blade knife. 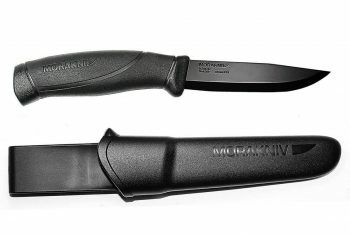 With that said, the Morakniv Companion Outdoor Knife is an easy model to recommend. Let’s start with the 4.1-inch stainless steel blade which should be able to easily handle whatever you throw at it. You can put a razor sharp edge on the Companion and it will stay there. It has a patterned, soft, friction grip handle made of a combination of plastic and rubber which makes the knife feel safe and steady to work with. The polymer knife sheath has a belt clip for attaching the knife to a backpack or belt. The knife snaps into the sheath with a little click. The Companion’s best and most popular uses are skinning, filleting and fine bushcraft carving. At little more than $10, this is one of the best fixed blade knives that you can give as a present. Related: Other than a knife, another essential thing that you always have to carry around with you whenever you head out to the wilderness is something to start a fire with. This Light My Fire Swedish FireSteel 2.0 Army is a good option. Not only is it capable of producing up to 12,000 strikes, it also has an emergency whistle attached. Description: A Camelbak M.U.L.E. Hydration Pack is a backpack or waist pack that combines space and pockets for the storage of enough gear for a day hike or bike ride with a rubber or flexible plastic reservoir for liquid. The reservoir has a capped mouth for filling and a hose that allows the wearer to drink hands-free. 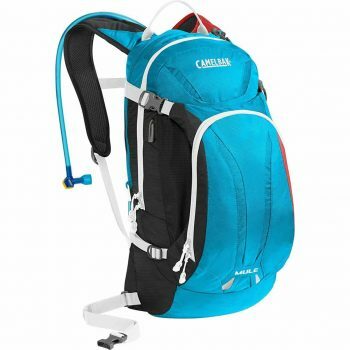 Since its inception in 1988, CamelBak has been one of the most popular hydration packs for all types of uses and has continued to add new features and design improvements to its basic product. Three zippered compartments, one with a gear organizer, allow you to pack everything you need for a day trip. An additional zippered pocket at the top of the pack with a weather resistant zipper and micro fleece lining holds a cell phone or media player. There is an exterior sleeve large enough to stuff a jacket. Two sets of compression straps allow you to pack an extra layer like a rain shell or a down jacket. Helmet hooks provide a way for bikers to carry their head protection when they’re not riding. Straps pivot on a narrow point of contact with the pack for a light comfortable fit. A strap management system keeps loose ends to a minimum. Lightweight back panels keep air moving over your back even when the pack is fully loaded. The reservoir compartment has a perimeter zipper that is easy to access. The reservoir itself has a large opening making it quick and easy to fill and clean. It opens and closes with a 1/4 turn. A clip keeps the hydration hose handy when not in use. The flow of water is good with minimal effort. The valve shuts securely so there’s no leakage. The drinking tube is easily removed and replaced. Related: This hydration pack has value to hikers because it offers a hands-free drinking system, which is very important when you’re in the middle of climbing up a really challenging trail. You may not be able to find a clean water source on such a difficult hike, which is where these Camelbak Cleaners come in handy. They will keep your hydration system clean and odorless effectively. Description: A personal cooking system is another gift that should certainly put a big smile to just about any outdoor enthusiast. 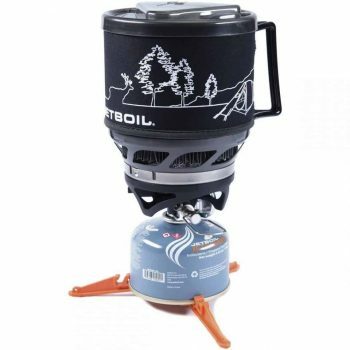 A good outdoor cooking system to consider is the JetBoil MiniMo Personal Cooking System. You can assemble this lightweight cooking system, including the pot, stove, gas canister and stove base in less than a minute. Turn on the gas and click the handy push-button igniter and you’re boiling water in around 2 minutes. The MiniMo will work anywhere on any type of trip, but where it really shines is lightweight backpacking and alpine climbing where you are cooking for just one person. However, it also works well for preparing meals for two person. In any situation, its strong points are heat rating and fuel efficiency. The push-button igniter is also a nice touch as far as convenience go. Among the joys of the MiniMo is its packability. All of its component parts: stove base, gas canister, canister stand, and pot support system are designed to fit comfortably inside the pot. The total weight of the whole package is only a little over a pound, including a full canister of gas. Related: Unfortunately, this cooking system is not a complete package in and of itself. There are several other things that you’ll have to purchase separately if you wish to be able to use this system properly, such as the Jetboil Stainless Steel Pot Support. Once you’ve bought the steel support, all you have to do is buy the fuel and you should be able to start boiling water immediately. 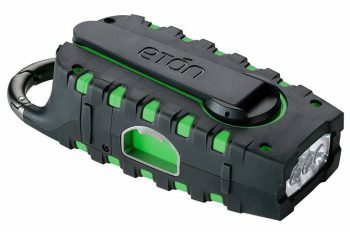 Description: Whether as a component of a bug out bag, backup communication for weather emergencies or as a companion on a hiking/camping adventure where the weight of a pack is not the overriding concern, the Eton Scorpion Emergency Crank Radio is a must-have. In tests, the Eton Scorpion generated nine minutes of battery life with two minutes of cranking. Backcountry reception is good, as is audio quality. The radio connects you to seven National Oceanic and Atmospheric Administration (NOAA) stations that provide weather alerts and warnings. Using a USB cord you can hand crank the radio to charge your mobile devices. You can also charge the Scorpion using a wall outlet as well as solar power. Wall outlet charging takes about 12.5 hours to go from a dead battery to a full charge. Solar charging takes about 10 hours of direct sunlight. One more charging option is to connect the radio to a computer via a USB Cord. The Eton Scorpion is designed tough. A thick rubber outer casing is splash proof and can take heavy outdoor use. Other features include a LED flashlight that provides up to 20 feet of visibility. A handy bottle opener is a part of the design as is the carabineer-style handle which allows you to attach the Scorpion to your backpack or bug out bag. Related: Although you can technically get the Eton Scorpion to survive on solar energy alone if you want to, it’s best to keep your options open. Instead of crossing off electric power sources for good, you should purchase this T-Power AC DC Adapter so you can charge the Scorpion if there are electric power sockets available. It might come in handy, especially when it’s nighttime. 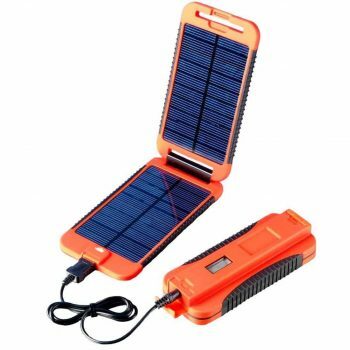 Description: The Powertraveller Powermonkey Solar Portable Charger is a must have for anyone going on a long-term hike in the wilderness where there wouldn’t be any electrical power sources for them to depend on for an extended period of time. With the ability to charge its 9000 mAh lithium polymer battery on solar energy and its amazing compatibility with a wide range of electrical devices, you’ll never have to worry about any of your important devices running out of juice while you’re out there. The Powermonkey has impressive durability—not only in terms of charging capacity but also physically. It is shock-resistant and waterproof up to a depth of 1 meter for 30 minutes. After a full 22-hour solar charging, the Powermonkey will have enough power to charge a smartphone up to 6 times and an SLR camera up to 2 times. Some consider the 22-hour charging period to be too long considering there are no more than 12 hours of daylight in a day, but even filling up half of the Powermonkey’s full battery capacity should be enough to keep most of your devices going for the rest of the day. Related: The Powermonkey should work as a power source for most flashlights also, but if you’ve got a flashlight that runs on batteries, you’ll want to have a few of these Yueling Rechargeable Li-Ion Batteries available. It’s best to go the extra mile in terms of preparations than risk having to go out without a flashlight at night in the wilderness. 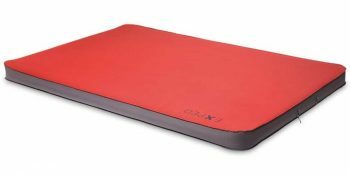 Description: What seems like it would be an obvious idea to anyone designing air mattresses is nevertheless a feature of the Exped Mega Mat 10 that is not shared by other air mattresses. That is, the air channels circulating air through the mattress are cut horizontally – side-to-side – rather than vertically or on an angle like most other mattresses. This keeps warm air inside the mattress rather than allowing it to escape top and bottom and results in the very high R rating of 9.5. The R rating measures the efficient retention of warm air – the higher the R rating the better. The walls of the mattress are 3.9 inches high and vertical – also different from most other mattresses – making for a roomy, firm, smooth sleeping surface. The top of the mattress is a non-slip laminated polyester, smooth and comfortable to the touch. Thanks to the 3.9-inch vertical walls, two mattresses fit neatly next to each other and can be joined by what Exped calls the “marriage gap” to minimize movement. To inflate the mattress, open the one-way inflation valve and let it self-inflate. If you require a little more air, snap on the included hand pump and keep inflating until the firmness meets your personal comfort level. To deflate, close the inflation valve and open the deflation valve and press the air out. Both valves have one-way back flow valves so you don’t have to worry about the mattress reinflating if you take a break during the process. In addition to the pump, each Mega Mat comes with its own stuff sack that includes a field repair kit. Related: Since this mat doesn’t come with a headrest, you’ll have to carry your own pillow if you don’t fancy the idea of sleeping without one. But don’t just grab the pillow you usually use at home because these take up a lot of space in the backpack. You’ll need a compressible pillow such as Therm-a-Rest Compressible Pillow. So there you have it: nine fun, useful, and, sometimes, cutting edge gift items for the outdoor people and gear lovers on your list this year. Buy any one of them, and your gift will surely be one that your camper friend will remember for a long time to come. It’s fine too if you’d like to look into it a bit more on your own to see if you can come up with something else that would suit your friend better. Just make sure to pay attention to the item’s durability, portability, waterproof capacity, and versatility. Go for quality instead of quantity because campers like to have dependable gear that they can entrust their life and safety to. What ideas do you have for these people on your list? Are you looking for something special? Did any of the products we’ve mentioned above seem like it would be the perfect gift for your outdoor enthusiast friend? Or do you have better ideas? Let us know all about it in the comments section.